People have been playing games with dice for a very long time, and for as longs as we’ve been playing with dice we’ve been worrying about how to make sure we (and everybody else we’re playing with) get a fair throw. One solution to this problem is the dice tower, a box you can toss your dice into and have them rattle out the bottom. Dice towers are nothing new, either. Here’s a Roman version. This tower was found on a villa in Germany, near the Rhine River. Dice tossed in the top cascaded through a series of baffles to randomize them and then down a series of steps a the bottom. On their way out, they would have knocked and rung thee little bells (only one of which survives). 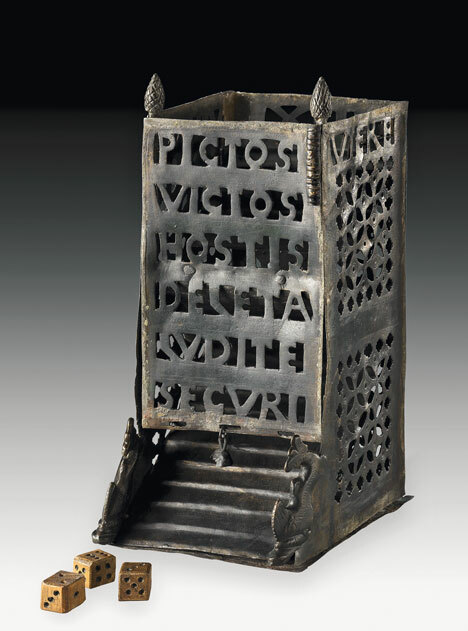 The Latin text on the step face reads: “The Picts are defeated. The enemy is destroyed. Play in peace.” This text helps date the tower to the fourth century, when the Picts first emerged as a power on the Roman frontier in Scotland. The Rhine was an important trade route that connected across the North Sea to Britain, so it is no surprise that people in the German provinces might want to celebrate a victory over the Picts with a game of dice. I love it when we find things like this, the little remnants of everyday life. Somebody probably had a lot of fun using this. Me too — it brings the past back to life.